The Mac has long had currency conversion tools available through Calculator app and Dashboard with the Converter widget, but the latest versions of OS X have an even faster option available with Spotlight, which can provide current exchange rates and conversions on the fly. You will need to be running at least OS X 10.10 or later to have this feature available to you from Spotlight. If you’re searching in USD, the first result will be in Euro, followed by the British Pound, Japanese Yen, Canadian Dollar, and Swiss Franc, though some of the responses are likely dependent on your regional settings as defined in OS X. If you want a specific currency, simply input that instead into Spotlight, for example “1 THB to USD” or “100000 IDR to EUR”. The currency conversions are done with Calculator app by gathering exchange rates from Yahoo, but the data is obviously aggregated into Spotlight for convenience. No more launching Calculator app, unless you want to at least. * If you’re unfamiliar with how to type various currency symbols in OS X aside from the one shown on your native Mac keyboard, you can access many with keystrokes or through the Currency Symbol portion of the Special Character Viewer panel. Whether you’re traveling to a region with a different monetary union, gearing up to lose money in ForEx trading, or just buying something online in a currency other than you own, knowing what it will cost you is rather important. 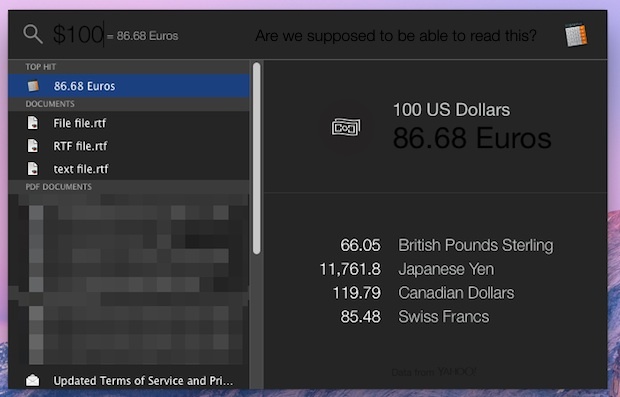 This is simply the easiest way to quickly determine exchange rates and convert currencies on the Mac, so the next time you’re wondering, turn to Spotlight in OS X. While this is a fantastic feature, you’ll probably not want to use Increase Contrast and Dark Mode options if you’re trying to use Spotlight in OS X 10.10.1 or 10.10.2, where for whatever reason the text in Spotlight is rendered black against a dark grey background, making it extraordinarily difficult to read. That’s almost certainly a user interface bug with Yosemite, since both of those aforementioned options generally make reading text in Yosemite easier. Presumably that will be fixed in an upcoming software update. If your Mac is on a prior version of OS X, you can continue to use Calculator, a Dashboard widget, or perform currency conversions with the iPhone. Spotlight conversions are not available to iOS, yet at least, but perhaps that will arrive soon in a future update. In the meantime, you can always ask Siri who will search the web for exchange rates and conversions for you. When I do this (running 10.10.1) I see the screen as above and then I get a crash report for spotlight, every time..
Me too. Try to use Spotlight, and it crashes repeatedly. OS X Yosemite, ladies and gentleman. And this is in the hands of millions of customers, LOL! Maybe Apple could hire a Quality Assurance team, huh? Useful feature for conversions, and funny commentary about Forex too. Just saw this on WSJ, thought it was relevant. Also, Dark Mode is so buggy that it shouldn’t have shipped. I mean, Yosemite shouldn’t have shipped in it’s current state either, but Dark Mode is like extra bad. Doesn’t work for me. Just brings up a list of Emails and Dev files. 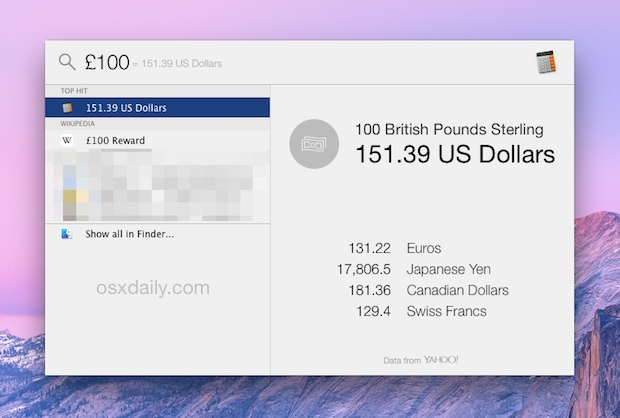 You must be on OS X Yosemite, then type something like “$100” into Spotlight for the exchange to happen into other currencies. If you modified your Spotlight settings or turned off some aspects of Spotlight, it may not work. Check your Spotlight settings. “Conversion” needs to be checked. I find it easier not to type the currency symbol into the Spotlight search window, but instead to type, say, “500 gbp”. The result for me shows Australian dollars firstly, with USD, EUR, JPY and CAD in the list below. If you type “500gbp in thb” you’ll get the first result in Thai baht. This doesn’t work on my Mac with Mavericks. I have not changed any settings in Spotlight, and there is no “Conversion” to check in Spotlight preferences. You can also type e.g. “1123.45 usd to eur” or “340 gram to pounds” etc and you will get the answer in the currency/unit you demanded. Hei guys. I just changed my regional setting to Romania (RON) and RON it`s still not appearing. I only get British Pound, Japanese YEN, etc… Can you help me figure this one out? This is such a great feature! Thanks. Im very furstrated right now about this small thing. I just switched from snow leopard to El Capitan (don’t ask). I am very happy for the most, still have to get used to some things. And this is one small thing I really get frustrated about. I used the converter a lot. Mostly calculating THB to EUR or the other way around. I don’t care about Pound, Dollar or whatever. Can’t I just have a currency converter like before? Ok, just found out dashboard still exists, I will still be using that for my currency converting issues I guess. You can get THB to EUR with Spotlight on Mac, or you can use it in Dashboard as you found. For Thai Baht to Euro conversion, enter something like “50 THB to EUR” and it should quickly convert the currency using the latest exchange rates for you. This does often require internet access however to get up to date rates.